On this Veterans Day, we salute some of the cats who have served in their countries armed forces. The badly wounded cat crawled on deck, and was rushed to the medical bay, where the ship’s surviving medical staff cleaned his burns, and removed four pieces of shrapnel, but he was not expected to last the night. He managed to survive, however, and after a period of recovery, returned to his former duties in spite of the indifference he faced from the new captain Lieutenant Commander John Kerans. While anchored in the river, the ship had become overrun with rats, and Simon took on the task of removing them with vigour, as well as raising the morale of the sailors. When Simon died in 1949 he was buried with full military honors and lies in PDSA Animal Cemetery in Ilford. Cats in the military have most often been ship cats, who have perform the practical function of ridding the ships of rodents and other potential pests, as well as boosting the crew’s morale. You can find many examples in this post from the Naval History Blog. “War Veteran – ‘Pooli’, who rates three service ribbons and four battle stars, shows she can still get into her old uniform as she prepares to celebrate her 15th birthday. The cat served aboard an attack transport during World War II.” Los Angeles, 1959. Cats have also served on land. Pfc Hammer served with an Army unit in Iraq in 2004. The cat, dubbed Pfc. Hammer, experienced the war right alongside the soldiers. He jumped at the sound of nearby gunfire and unexpected explosions when they did. He would always take the soldiers’ minds off of the war at just the right time. During a mortar attack on the unit Hammer ran to the bunker with everyone else. The nearest soldier picked up the cat and tucked the feline inside his body armor for safe keeping until the attack was over. In the true spirit of “no soldier left behind”, the unit made sure that Hammer was able to come back to the U.S. with them. 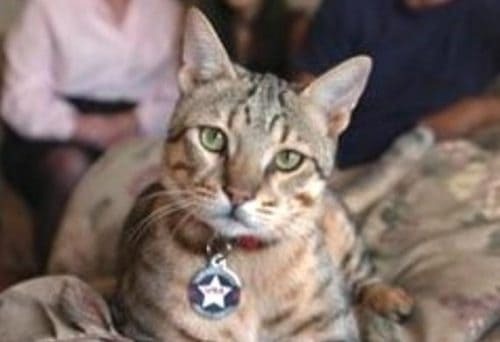 With the help of Alley Cat Allies and Military Mascots, he was relocated stateside and no lives with fellow veteran Staff Sgt. Rick Bousfield and his family. 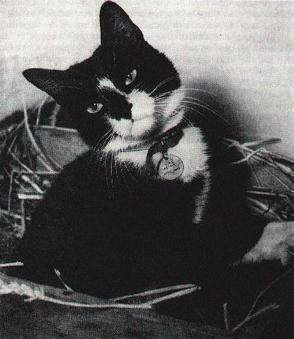 If you have stories of cats who have served in war, we would love to hear from you in the comments below. On a serious note, cats have a long history of military service. 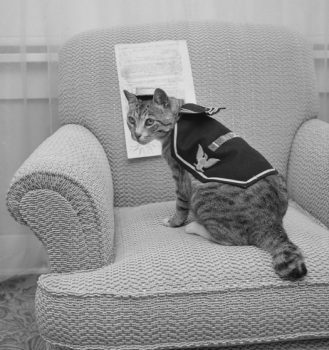 Many military cats served on board ships as mascots or working cats (i.e., helping control rodents) or both. Pooli served on board a US attack transport during World War II. There is also Pfc Hammer, an Iraqi kitten adopted by American soldiers. Hammer served with Headquarters and Headquarters Company, 1st Battalion, 8th Infantry Regiment, 4th Infantry Division in Iraq and ultimately came to live in Denver with Staff Sgt. Rick Bousfield. Pets are often left behind by soldiers who deploy to wars, including the current war in Afghanistan. There are organizations, like Pets for Patriots in Hawaii, that help find foster homes to care for military pets during deployment. Here we see a cat named Fancy getting ready to go to a foster home while her military humans are away. Finally, we encourage readers to visit our article on the Presidio Pet Cemetery here in San Francisco. We visited the site last Memorial Day. The dismantling of Doyle Drive is occurring right over the site at the moment so it is closed, but we hope to visit again soon.